The Gankogui is an African bell. 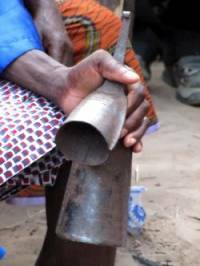 This simple percussion instrument is made of forged iron and comes in various sizes. The Ewe are a West African tribe. They mainly live in the Volta Region of Ghana and parts of Togo on the other side of the border. The Ewe are very famous for their music: Ewe drumming is actually taught in Universities all around the globe. 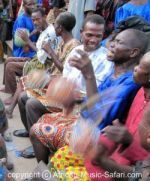 In an Ewe ensemble, the musicians use various types of drums, depending on the piece they play. But one small instrument is always present: the Gankogui. The bell pattern is the key to the rhythm. It provides the time line, after which every other instrument in the ensemble orientates itself. 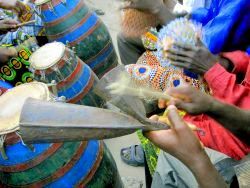 Ewe drumming (like most African music) is polymetric. This means for instance: While the bell repeats a 4/4 pattern three times, the drums may repeat a 3/4 rhythm four times. So, instead of a common beat, we should rather call it a relation. Obviously, the bell player must play very steadily to maintain the relationships between the various instruments. Otherwise, he will confuse the whole ensemble. In Ghana, one thing always amazes me: If you're looking to buy a bell, and you can't find it at the art market, you'll definitely find it where fetish and traditional medicines are sold. In traditional shrines, its sound calls the Gods and spirits for help and advice. Messangers walk through villages, playing a certain bell rhythm. This calls the villagers to gather for an announcement by the local chief or king. Fitness groups gather on Sundays for a run through their towns. Bell rhythms motivate and pace the runners. The Gankogui - An instrument the Ewe just can't do without.